Looking towards the Chocolate Hills, Bohol, Philippines. 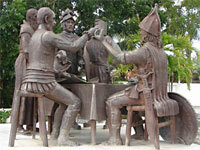 A Bohol Countryside Tour takes you on a memorable trip around the main tourist attractions of Bohol island. These include the remarkable Chocolate Hills, the Blood Compact Shrine, Baclayon Church, the Man Made Forest, and a Loboc River Cruise. You'll also get to see tarsiers, the world's smallest primates. This is a popular tour in the Central Visayas region of the Philippines. 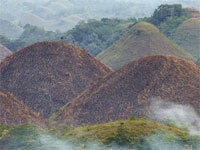 The Chocolate Hills consist of around 1250 hills, uniform in shape and mostly between thirty and fifty metres high. They are covered in grass, which turns chocolate brown at the end of the dry season, from which they get their name. 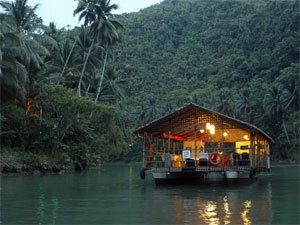 The Loboc River is a major tourist destination of Bohol. Visitors can cruise a section of the river aboard small bancas or floating restaurants. Visitors are treated to terrific scenery including lush tropical vegetation, nipa palms, coconut trees, and banana groves. Local musicians and dancers will entertain you, skipping over long bamboo poles. This is "tinikling" - the Philippines' national dance. Originally constructed using just bamboo and rope, today it has been reinforced with steel cables, making it safer and giving added stability. 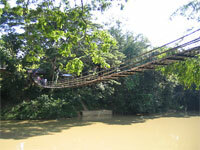 The Man Made Forest is a mahogany forest stretching over two kilometres between the towns of Loboc and Bilar. It is reputed to be the first and only man-made forest in the Philippines. The historic Baclayon Church is considered to be the second oldest Catholic stone church in the Philippines. the Philippine Tarsier is one of the smallest known primates. Although it is now a protected species, it is still threatened by the destruction of its natural forest environment. Visitors to Bohol can see the tarsier, in its natural habitat, at the Philippine Tarsier Foundation.